Your donation will help raise funding for Equine Guelph programs. We currently hold raffles at high profile trade shows where EquiMania! is on tour. Equine Guelph has also held auctions like the one listed below and would like to plan similar events in the future. The donation of your product will not only gain exposure in the equine industry but will also help Equine Guelph with their mandate of helping horses for life. 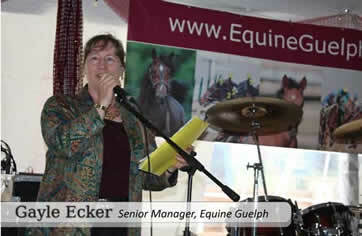 Equine Guelph thanks everyone for making the Gala Fundraiser (June 4) at the Equine Expo a success. 2 push brooms 24" and 31"
and Carson Auction for their donations to the Gala.